In our post-Pokémon Go world, lovingly recreating Ghostbusters props isn’t the strangest hobby one can have. But it’s certainly up there. 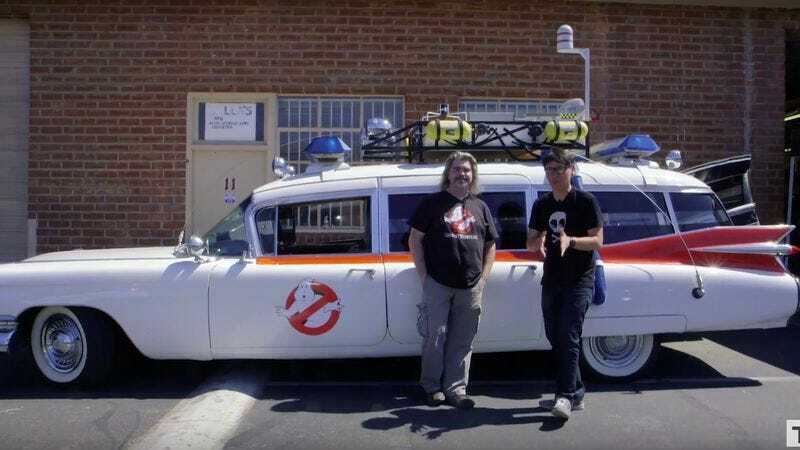 And Adam Savage’s YouTube series Tested offers some insights into the prop recreation community as host Norman Chan interviews DreamWorks Animation storyboard artist/voice actor Sean Bishop about his detailed replica of the original Ghostbusters’ Ecto-1. Bishop notes that he’s been working on the car on and off for about 12 years, although the past year and the half have been the most focused. Thanks to his production connections, he was able to pay a visit to the Sony lot and take photos of the original movie car for reference. He then purchased a 1959 Cadillac Miller-Meteor “source car” for less than 10 grand on Ebay. The outside of the car is recreated in excruciating detail, but Bishop got a little more creative for the inside. “It’s a liberal mixture of the Ecto-1 and the Ecto-1A with slight nods to the cartoon,” he explains. Bishop also offers some insights into the larger Ghostbusters prop recreation community as well. He explains that the new trend among Ecto-1 builders is peaceful cooperation. People are generally more than happy to trade duplicates and bulk buys of hard-to-find items for other rare pieces. There are apparently about “seven-ish” people with “really nice Ectos on the road” and they’ve formed a little community to support and commiserate with each other.